Ex-supervillain Gru (voiced by Steve Carell), now a family man with three adopted daughters and a host of minions to provide for, is called into service by the Anti-Villain League to help track down a new supervillain. The original 2010 animated feature DESPICABLE ME hit the world like a cute and fluffy unicorn to the solar plexus. It was refreshingly unafraid to make the villain the anti-hero, and view the story through his sociopathic lens. Here was a guy who would “freeze-ray” a queue of people just to cut the line and get his coffee first; who would steal the moon just for the renown of being the Greatest Supervillain in the World. Gru the anti-hero would eventually arc to find his humanity amongst three little girls, but that did not change the dynamic of that film, and what made it so wickedly enjoyable. 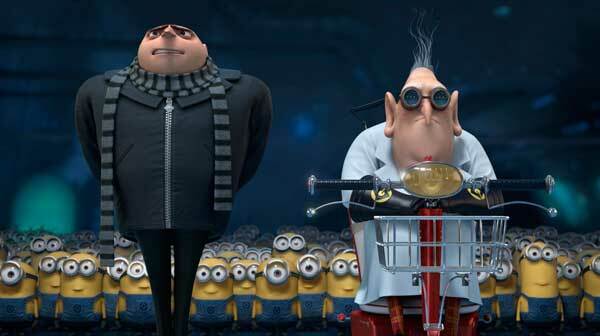 Gru’s despicability was balanced by the innocence of the girls, and the incognizance of his puffball minions. The sequel, though fun, has forsaken that dynamic: DESPICABLE ME 2 finds the seething villain as a bona fide good guy – Gru is trying to make a legitimate go of his jam and jelly business, his minions not engaged in outlandish weaponry tests or insane acts of pummeling each other, but rather dancing around making condiments. Even his right hand mad scientist, Dr. Nefario (voice of Russell Brand), quits Gru’s employ because it’s not eeevil enough for him anymore. In this film, Gru does not have to make a giant leap to find a heart, he already has one, and now the filmmakers merely nudge him one step further by providing an adult love interest, Lucy Wild (Kristen Wiig). It is nowhere near the leap Gru had to make in the first film. Thus, the character seems a little static. And the stock love story seems tailor-made in a screenplay factory on a minion conveyor belt. Brought to us by the same team who made the original (writers Cinco Paul and Ken Daurio, and directors Pierre Coffin and Chris Renaud), DM2 is a more “normalized” adventure, where a British spy agency (AVL, headed by Steve Coogan) recruits Gru, and partners him with Lucy, to track down a villain. Stock action movie mystery proceeds apace, with voice cameos by Ken Jeong, Kristen Schaal, and Benjamin Bratt as the villain El Macho. The minions wander through at intervals creating spastic vignettes, but only in the latter part of the film are they necessary, as El Macho transforms them into killing machines. The inevitable family subplot, as Gru falls for Lucy, reconciles with Nefario and must save his minions from themselves. Steve Carell still plays Gru to the hilt, and his accent is over half the hilarity. Lucy Wild’s cartoon kinda overacts a little for my taste, though the overall animation of all the characters is still stunning in its detail, especially in the closeup face shots. The minions are no longer as bitingly cute or funny as they used to be, in stiff competition with the peripheral sight gags in frenetic animated adventures like CLOUDY WITH A CHANCE OF MEATBALLS. 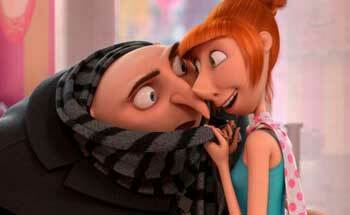 Gone is the combative attitude of Gru’s three little girls; they all adore Gru and are trying to set him up on dates. The oldest (Miranda Cosgrove) is ready to moon over boys, the middle (Dana Gaier) is wary of boy germs, and the youngest (Elsie Fisher) romantically idealizes having a mom in Lucy. And how despicable can Gru possibly be if his plan is to “save the world” rather than discombobulate it with a fart gun? Starring: Steve Carell, Kristen Wiig, Benjamin Bratt, Miranda Cosgrove, Russell Brand, Ken Jeong, Steve Coogan, Elsie Fisher, Dana Gaier, Kristen Schaal, Pierre Coffin, Chris Renaud, Moises Arias.